When the acorn squash is cooling, bring a pot of heavily salted water to a boil. 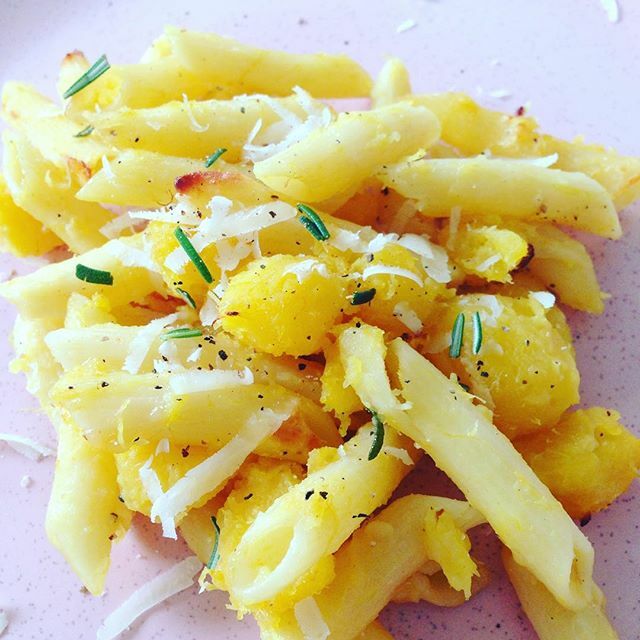 When pasta is half way done, remove pasta with a slotted spoon and add to the pan with the squash. Reserve the pasta water! Add a half a cup of the reserved pasta water to the pan and continually stir the pasta and squash mixture on medium high until the penne is al dente. Add more water if the pan gets dry and the pasta is not yet cooked. Stir in the remaining fresh rosemary, then layer into a serving dish, adding a layer of shredded parm in between layers of pasta.